Carving a career path is not about choosing something that is popular, one that everyone else seems to be doing or one that gives you the highest financial returns. For Muslims, it is of utmost importance that we choose the right career path as it is a decision that will affect our productivity. It also has the potential to make or break not only our worldly life but also our hereafter. 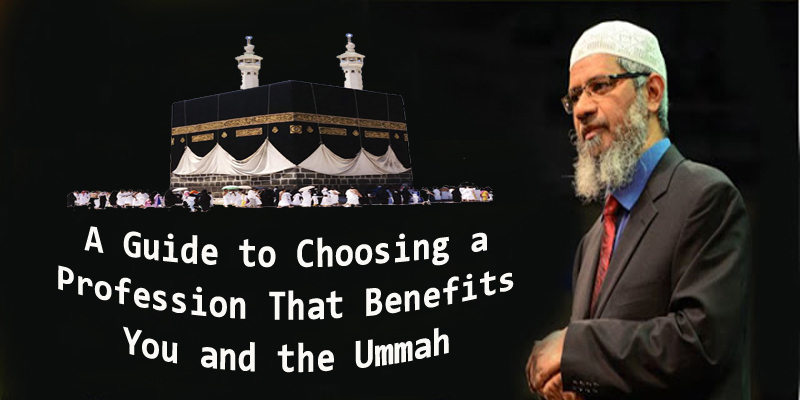 By choosing a profession that benefits the Ummah, our career will not only be a source of permissible income for us, but it is also a form of social productivity that brings not only the Muslim Ummah closer to Allah (glorified and exalted be He) but also provides opportunities for non-Muslims to come to the same path. This will benefit us in the world and our status will be elevated in the hereafter as well, In sha Allah. Indeed earning a halal income based on our own efforts is encouraged by the prophet (peace and blessings of Allah be upon him). So how exactly do we choose a career from an Islamic perspective and a path that will benefit the Ummah? Below are some pointers that will help us to at least start thinking along the right lines and get the ball rolling in the way of Allah (glorified and exalted be He) and His creation. While choosing a career, it is important that we follow our strengths. We should choose a path that is close to our hearts and one that we like. However, it is equally important that it is one that feeds off the strengths blessed upon you by Allah (glorified and exalted be He). All of us have our strengths and it is of utmost importance that we make an effort to identify those. This could be done through assessment activities, such as taking online questionnaires and surveys. It can also be done through self-reflection and assessing what is it that you like to do and are good at compared to your other skills and also in comparison to other individuals in society. To gain a deeper insight into the job that you are interested in, you could sign up for internships or apprenticeship programs. More often than not, we would perform better at something that we naturally enjoy as opposed to something that we have to make an effort to do. The better we perform our job, the better the position we will be in to benefit the Ummah. For example, if we possess strong presentation/ communication or public speaking skills, we could consider becoming a da’ee and invite people to Islam. If we have a good grasp of the Arabic language and enjoy interaction with others, we can consider taking up teaching Arabic as a vocation. It has been seen many a times that a person chooses a career path blindly without thinking about its religious implications. There are certain careers that involve certain forbidden characteristics such as immoral behavior, corruption, bribery or interest-based transactions. Any career that would involve such characteristics would be questionable and the income of which is deemed haram by Allah (glorified and exalted be He). In many cases, it is until after many years they realize that the money they have been earning for all these years was forbidden and they have been accumulating nothing but sins all their life. At this point, it becomes the biggest test of your life as it is something that you have invested much money and time in and for people of weaker Iman, it becomes almost impossible to go back on your actions. How is it possible to benefit the Ummah through a career which is plainly haram? How can they hope to attain any reward from it? Hence, the importance of keeping the career halal at all times. The importance of seeking the pleasure of Allah (glorified and exalted be He) cannot be emphasized enough. While choosing a career path, always keep in mind that our aim is to gain the pleasure of Allah (glorified and exalted be He). Hence, we should choose a path which will enable us to remain steadfast on the teachings of Islam as detailed in the Qur’an or hadith and ones which will not only enable benefit of the Ummah but you as an individual will also gain the reward for the good deeds. For example, we may choose to have the job of an administrator, maybe at a department level, company level or even the country level. Our aim should be the implementation of the Shariah laws both at a personal as well as societal level. When we are in a position of authority and have a say over policy making and how our organization can benefit the Ummah, then this can serve as an opportunity to implement shariah at a societal level where the tenets of the deen are preserved. Be it at the social, economical, political or the financial aspects of a set-up. Moreover, the honor, dignity, property/wealth and family can also be protected by making sure that all practices fall within the boundaries set by Allah (glorified and exalted be He). In this way you will ensure the maximum benefit for the Ummah as you will be enabling them to follow the rules laid out by Allah (glorified and exalted be He). Set an example for other Muslims to follow. One of the common examples of this is banking where there were always debates and confusion on whether the type of banking in place was halal or haram. As a result of this, Islamic banking was established, which ensured that the issue of interest along with others was taken care of. Similarly, many Muslim and some non-Muslim countries have come with the idea of having halal hotels where forbidden things like alcohol or non-halal meat is not served. Moreover, other activities like music and dances have been entirely eliminated to make these hotels Islam friendly. These are examples of how we can choose a path that will enable us to establish businesses based on Islamic concepts, giving you the opportunity to help the Ummah practice the religion and also help you gain lots of reward. Identification of such niche areas can be carried out through picking businesses that you are interested in, followed by an analysis of the forbidden practices performed in those businesses, and an identification of how these can be removed and whether the business would still be beneficial or not. For example, if we want to open a hotel of our own, we can start by identifying that the selling/ serving of alcohol/ non-halal meat, playing of music etc. are forbidden. Then we can picture opening a hotel that is clean of such vices. Similarly, this idea is applicable to other careers as well. One of the most important points to remember is that we are rewarded for whatever action we take based on our niyyah or intentions. Narrated ‘Umar bin Al-Khattab (may Allāh be pleased with him): The Prophet (peace and blessings of Allah be upon him) said, “The rewards (of deeds) are according to the intention, and everybody will get the reward for what he has intended. So whoever emigrated for Allah’s and His Apostle’s sake, his emigration was for Allah and His Apostle ṣallallāhu 'alayhi wa sallam (peace and blessings of Allāh be upon him); and whoever emigrated for worldly benefits, or to marry a woman, then his emigration was for the thing for what he emigrated for.” [Bukhari]. This is especially for those who have already chosen a career path and might be thinking how their careers benefit the Ummah. Some might even be thinking of what new career path they can take. But wait, you might not have to take that drastic step. Whatever you are doing, just make sure that you correct your intention. Make your intention of whatever you do for Allah (glorified and exalted be He) only. This action will ensure that you get reward even for the apparently worldly career path that you may have. You can do this by utilizing your expertise to help the Muslims, or the Muslim businesses. You can concentrate on community work by thinking of the advancement of Muslims in their corporate or professional careers as well and many such ways. Remember, it is never difficult to benefit the Ummah whatever your career maybe as long as it is halal. There is always a way, In sha Allah. Last but not the least, always pray to Allah (glorified and exalted be He) for his help and guidance in all matters. Always pray salaatul Istikhara beforetaking any action so as to have the will and permission of Allah (glorified and exalted be He) in every action you take and In sha Allah you will be on the right path. And when they have [nearly] fulfilled their term, either retain them according to acceptable terms or part with them according to acceptable terms. And bring to witness two just men from among you and establish the testimony for [the acceptance of] Allah. That is instructed to whoever should believe in Allah and the Last day. And whoever fears Allah – He will make for him a way out. May Allah (glorified and exalted be He) guide us to the right path and let us fulfill our responsibilities with dignity, honor and grace. Ameen.